The Autism Society Philippines, in partnership with St. Jude College, hosted a seminar on Understanding Persons with Disabilities: Journey with Autism last 06 December 2014. The seminar was participated by students and professors of St. Jude College and ASP members from different chapters. It was an informative day for everyone. The seminar started by an inspirational Opening Remarks and a 1Pangako pledge with students, teachers and ASP members led by Ms. Mona Magno-Veluz, ASP National President. Ms. Dang Koe started the seminar by sharing their own family journey with their son Gio. She shared their own strugles and how they handle all the problem that came into their life when they discover about Gio. Ms. Dang shows some photos of the different aspect of a CWA. She mentioned that parents like them and especially CWA they all need acceptance and understanding from each and everyone. After the talk of Ms. Dang, Robert Meigh “Buboy” Dolor, a CWA from Hopewell Integrated School, share his talent by giving everyone a wonderful song. Participants are happy and enjoyed every moment of Buboy. The second part of the seminar was facilitated by Mr. Evert Malapad who is also a proud father of a CWA and a former ASP Board of Trustees. He talked about care and intervention for ASD. 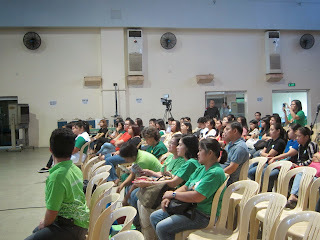 Sir Evert shares that every common issues of a person’s with autism should be focus on in order to guide them properly. It should be start from early childhood up to their adulthood stage. He also mentioned the important roles of the professionals in every stages of life of a PWA. They are the one that will teach the pwa to become more independent especially before they reach their adolescent stage where in they need to learn to live independently or even working on their own. Sir Evert also shares that parents and even professionals should know the skills of a persons with autism where they can focus on it and trained them base on their skills. Because thru this skils it can help PWA’s find a suitable job for him in the future. The afternoon was ended with a talk from Mr. Rizalio Sanchez, Head of the Information, Education and Communication Division of the National Council on Disability Affairs on the rights of students with disabilities to tertiary education. About the contributor. Ida Blasco graduated with the degree of Bachelor of Science in Psychology at Our Lady of Fatima University. After years abroad, Ida has come home to serve the autism community as the ASP's Admin Manager.